While for some women menopause happens without many symptoms, or without unpleasant symptoms, other women can find menopause quite disruptive. You can manage many symptoms through lifestyle changes and self-help techniques, but may need your GP's help to manage more severe symptoms. making sure you stay physically active. There are many good techniques for improving your sleep habits. Not getting enough sleep is not only unpleasant, it can also affect your quality of life, increase your risk of accidents, and reduce your concentration and memory. Some people find complementary therapies such as acupuncture, vitamins, and herbal remedies are helpful, but there is limited research to say whether or not they work. You may find this short video about some of the options for managing your symptoms (including complementary therapies) useful. Hormone replacement therapy (HRT) may be a treatment option for you if your symptoms are troubling and affecting the quality of your life. As you go through menopause, you produce less of the hormone oestrogen. This is what causes the symptoms of menopause. HRT replaces some of that oestrogen, and is the best way of improving the troublesome symptoms of menopause. 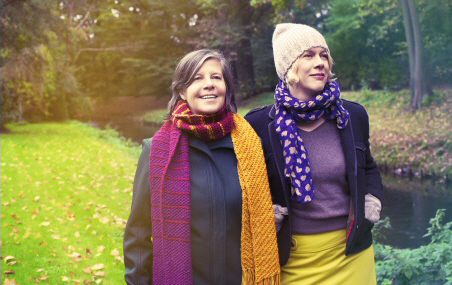 As well as improving the symptoms of menopause, HRT improves your cholesterol levels, and increases your bone strength – reducing your chances of getting osteoporosis (weak bones). There are two types of HRT: oestrogen-only HRT and combined HRT. This is suitable for women who have had a hysterectomy (no longer have a womb). Oestrogen-only HRT is available as a tablet or patch. Oestrogen can also be given as a vaginal pessary or gel to help with vaginal dryness. This type of HRT includes oestrogen and progestogen, which replaces the second female hormone, progesterone. Women who still have a womb need to take combined HRT. If they take oestrogen only, it affects the lining of their womb and can increase the risk of uterine cancer (cancer of the womb). Progestogen stops this from happening. Progesterone can be added to oestrogen-only HRT as a tablet. Combined tablets with oestrogen and progesterone are also available. This short video explains the different types of HRT and the different ways of taking it. Most women who have troublesome symptoms of menopause that are affecting their everyday life can take HRT safely. If they use it as a short-term measure (up to five years), the benefits of taking it outweigh any risks. There are some women who should not take it. These include women with hormone-dependent breast cancer, and women who have had heart disease or a history of blood clots. This short video explains the safety and risks of HRT. The length of time you can safely take HRT depends on your particular situation and how bad your symptoms are. Many women need to take it for a few years. Generally it's considered safe for five years. However, some women need to take it for longer than five years because they still have troublesome symptoms. If this applies to you, your doctor may suggest stopping or reducing your dose to see if your symptoms have settled down. They may also suggest changing to a different preparation which is safe to use long-term. Managing menopause symptoms, and the risks and benefits of particular treatments, can be a confusing subject. If you have further questions, talk to your GP about your concerns. Written by HealthInfo clinical advisers. Endorsed by clinical director Obstetrics & Gynaecology, Canterbury DHB. Page created November 2016. Last updated July 2018.